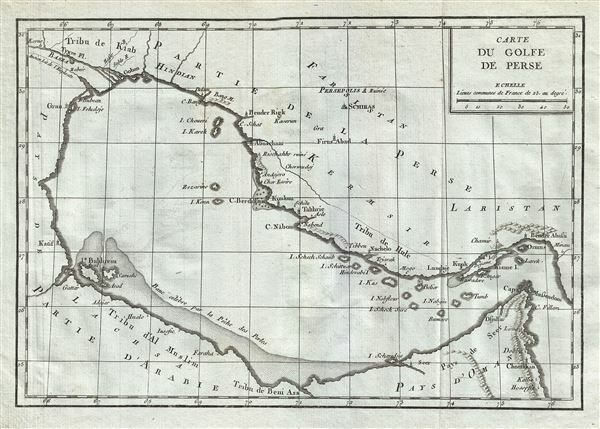 Scarce map of the Pesian Gulf. Carte du Golfe de Perse. This is a beautiful example of the 1770 Jean-Baptiste-Claude Delisle de Sales' map of the Persian Gulf. The map covers from Basra to the Strait of Hormuz, and includes parts of modern day Kuwait, Bahrain, Qatar, Iran, the United Arab Emirates, Dubai, and Oman. De Sales map primarily follows the cartography laid down by D'Anville in 1758 with a few notable updates, especially along the Arabian coasts. The Qatar Peninsula is entirely absent, but the island of Bahrain is noted, though misaligned. The Saudi city of Qatif (el Katif) is however clearly identified. The great pearl banks, for which this region was famous prior to the oil boom, are identified via shading. De Sales incorporates several advancements over the D'Anville model including the addition five cities along the Arabian coasts: Adajar, Huale, Iusofie, and Faraha. The Persian side of the map also exhibits a number of updates and a far more sophisticated inland cartography. Nevertheless, it remains remarkable just how primitive European knowledge of the Persian Gulf remained even in the late 18th century. This map was issued as part of Delisle de Sales' Histoire des Hommes. Partie de l'Histoire Moderne. This volume is exceedingly rare as most of Sales' work was burnt under the censorship of heresy. Delisle de Sales, Histoire des Hommes. Partie de l'Histoire Moderne (Paris) 1770.